Here is a story from the Dec. 8th issue of the Winnipeg Free Press. When you go to the website, you will find three sections described thus: (1) View over 10,000 digitized archival documents relating to immigration and immigration policy in western Canada from the holdings of the University of Manitoba Archives & Special Collections and the University of Saskatchewan Archives; (2) View three hundred images from the holdings of the archives of Oseredok, the Ukrainian Cultural and Educational Centre. The images are presented along with an accompanying historical narrative pertaining to the experience of Ukrainian immigrants in western Canada; (3) Experience this learning tool designed for students and teachers in grade six. Contains lesson plans and activities for teachers, a historical text with accompanying images of archival material, and a fun, yet educational, game for students relating to immigration and immigration policy in the early-twentieth century. 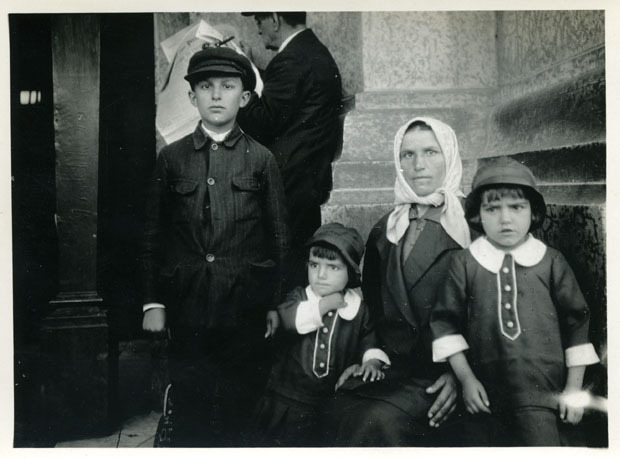 The photograph above, with this accompanying description, is one of many from Oseredok: A photograph taken by Ivan Bobersky of a Ukrainian immigrant woman and her children in Winnipeg, Manitoba, dated ca. 1920s. Look at the fear and uncertainty -- and determination -- in their faces. Here they are in a new land, surrounded by strangeness and the unfamiliar. What brave ancestors! LEARNING about the hardships of immigrant homesteaders on the prairies through their own letters, diaries and photos is only a few clicks of a mouse away. Called the Prairie Immigration Experience, almost 15,000 documents from the archives of the University of Manitoba, the University of Saskatchewan, and the Ukrainian Cultural and Educational Centre in Winnipeg have been digitized and put on a new website. Brett Lougheed, of the U of M's archives and special collections department, said about 5,000 of the images come from documents stored at his university, while about 15,000 come from the University of Saskatchewan. The Ukrainian Cultural and Education Centre has its 300 images on a link from the website's main page. "A lot of people had this material in their basements and they wanted it to be saved so they gave them to us," Lougheed said on Thursday. "Now anyone with a computer can access this material 24 hours a day, seven days a week." He said documents on the website show the struggles faced by immigrants from various nationalities. These include Czech, Danish, English, Jewish, and Ukrainian. As well, Lougheed said some of the collections include audio interviews with immigrants while one has a video clip. "Ease of access was the main reason why we wanted to do this. It wasn't done for preservation reasons, but to improve access, but if there is less handling of the archival material itself, it can be maintained for much longer." Lougheed said seven of the archival collections on the website come from the University of Saskatchewan while the rest come from the University of Manitoba. Lougheed said a separate link will take Grade 6 students -- and their teachers -- to an education site made up of lesson plans, activities for teachers and an educational game. The Prairie Immigration Experience website can be reached here.